Military bureaucrats enforcing Israel's blockade of Gaza allow frozen salmon filet, facial scrub and low-fat yogurt into the Hamas-ruled territory. Cilantro and instant coffee are another matter - they are banned as luxury items. Over the past three years, Israel has determined down to the tiniest detail what gets into the Gaza Strip and to its population of 1.5 million, using secret guidelines to differentiate between humanitarian necessities and nonessential luxuries in its blockade meant to squeeze the Islamic militant group Hamas. The results are often baffling. "Frozen salmon - we never had it before the blockade," said perplexed salesman Abed Nasser, examining a frozen chunk of fish. Critics have long maintained that Israel's blockade, imposed after Hamas' violent takeover of Gaza in 2007, has not just been confusing, but counterproductive. It has come under renewed scrutiny this week; as CBS Radio News correspondent Robert Berger reports, a flotilla of eight ships carrying more than 700 pro-Palestinian activists and 10,000 tons of supplies is heading towards Gaza in an attempt to break Israel's blockade. Israeli Col. Moshe Levy, a senior military official dealing with Gaza, called the flotilla a "provocation" and said all necessary humanitarian aid already reaches Gaza. 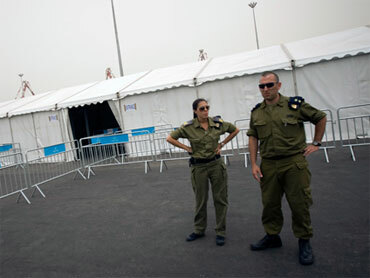 Israeli officials say they will stop the flotilla by hauling the ships to an Israeli port if they don't turn back. Israeli Heckler Calls Rahm Emanuel "Anti-Semite"
Critics say the blockade has failed to dislodge Hamas and has hurt Gaza's poor and blocked reconstruction after Israel's devastating three-week military offensive in the winter of 2008-2009. A Palestinian industry report says the blockade has wiped out over 100,000 jobs in Gaza by banning raw materials and stifling trade. With small exceptions for international aid projects, raw goods vital for trade and construction are banned. A biscuit factory cannot import margarine, and a tomato paste factory cannot bring in empty cans. While fruits, vegetables and frozen meats are let in, fresh meat, vinegar and jam, are not, said Sari Bashi of the Israeli rights group Gisha. "There are enough quantities of basic food items in Gaza. But because there is a ban on raw materials needed for production and a ban on exporting finished products, people don't have enough money to buy things," she said. "That's why 80 percent of Gaza residents are dependent on international assistance." Meanwhile, tunnels built under the Gaza-Egypt border haul in scarce goods at inflated prices, enriching smugglers and Hamas, which taxes the trade. Gaza markets are filled with smuggled products like chocolate sauce and shiny children's shoes that most residents cannot afford. Hamas officials have used smuggled cement to rebuild the notorious Ansar prison where they detain their rivals, and are currently building a shopping center. But three years after the blockade, Israel is only now shipping in the building materials the U.N. needs to construct 151 apartments for some of Gaza's poorest residents. "Gaza is being reconstructed - it's just that the U.N. is not doing any of the reconstruction," said U.N. spokesman Chris Gunness. He said the U.N. still had not been given permission to build another 450 apartments in the same project, nor to start rebuilding the 2,400 homes that were destroyed during the war. Israel has bristled at criticism, insisting there are no shortages of food or other essential goods. On Wednesday, Israel's Government Press Office issued a news release sarcastically encouraging people to visit one of Gaza's few upscale restaurants, Roots Club, which uses a mixture of smuggled and legally imported goods for its menu. "We have been told the beef stroganoff and cream of spinach soup are highly recommended," it said, attaching a menu. The press office's director, Daniel Seaman, said he issued the release to counter "propaganda" about a humanitarian crisis in Gaza. Gaza's tiny elite and foreigners are well served by the handful of restaurants like Roots, where a meal costs more than a typical Gazan's daily wage. But such places are out of reach for virtually all of Gaza's residents, who overwhelmingly rely on U.N.-donated food aid. Israel says the blockade aims to dry up Hamas' homegrown weapons industry by keeping out steel that can be forged into rockets and fertilizer that can be turned into explosives. Officials say the blockade also constrains Hamas' ability to rule and pressures it to release Sgt. Gilad Schalit, an Israeli soldier held captive for four years. With Egypt destroying some tunnels and restricting the inflow of cash, Hamas has struggled to pay the salaries of its 32,000 civil servants and security forces in recent months. But Hamas remains firmly in power, and residents are left uncertain about what Israel will allow in at any given time. Israeli refuses to say what it bans or permits. The government said revealing that information would harm Israel's security and foreign relations, in response to a court challenge by the rights group Gisha in May. Maj. Guy Inbar, an Israeli military official, said Israel bans "luxury" food items because they "will not be consumed by the public - but only by the rich and corrupt Hamas leaders." The luxuries include goods considered staples in Gaza, like honey, instant coffee and spices, according to Bashi and Palestinian liaison official Raed Fattouh. Not included are the frozen seafood or low-fat yogurt purchased by Gaza's wealthy few at the al-Rimal supermarket, or facial scrubs and skin-whitening sunscreen at a nearby upmarket pharmacy - all from Israel. Seafood comes as frozen meat, skin creams as feminine hygiene products and diet yogurt comes as dairy, categories permitted by Israel. Some items have now been allowed to enter after being banned for years, like clothing, shoes and tea, providing the surreal sight of gleaming, expensive boxes of Israeli-imported caffeine-free blueberry tea sold alongside knocked-around boxes of tunnel-smuggled black tea. "Sometimes we ask (the Israelis) why some things are banned," Fattouh said. "'Release Schalit and make Hamas step down and then we'll lift the blockade,'" he said, quoting Israeli officials. "But there's no problem if you want to have a salmon dinner."